Your Last Chance to Buy Etsy Success Stories. Ever. It’s time to say goodbye to my very first ebook. 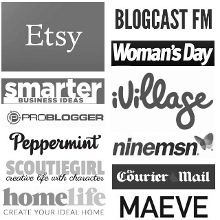 I released Etsy Success Stories (This site/resource is no longer available.) back in 2010, and since then, many hundreds (actually, it’s probably nearer the thousands!) of crafty business dreamers have read it and used the tried-and-true techniques shared by 7 Etsy Top Sellers to turn their businesses into full-time success stories. So why am I retiring it? I still think the interviews inside are valuable. I still think the information and tips inside can help Etsy sellers stand out from the crowd. Honestly – I’m retiring it because I no longer feel it’s my best work. I’ve got plans for new C&T Guides – guides that will be up-to-date with everything I have learnt since 2010. So, I’m saying goodbye to Etsy Success Stories in order to make way for new, fresh, and updated guides that will be coming over the next few months (and years!). But I didn’t want to retire the book without giving you the chance to get a copy if you’ve been thinking about it! Some of the information in here most likely won’t make it into new guides. Some of it will – but I haven’t decided what to keep and what to let go of just yet. To find out more about ESS, and grab a copy for just $12 (it normally sold for $17) click here (This site/resource is no longer available.) . I’ll be taking ESS off the virtual shelves on Thursday night, at 9pm, Aussie time. (That’s early Thursday morning if you’re in the US/Canada). So – if you do want a copy, don’t hesitate – I won’t be extending the sale past that point. To everyone who has bought a copy over the years – THANK YOU! I hope something in this guide has helped you take steps towards building the business you dream of!